If you have read Ruth Richardson’s wonderful ‘dissection’ of medical textbook Anatomy, Descriptive and Surgical (original title of Gray’s Anatomy), you may be aware of a remarkable manuscript held here in the archive at the Royal College of Surgeons of Edinburgh. 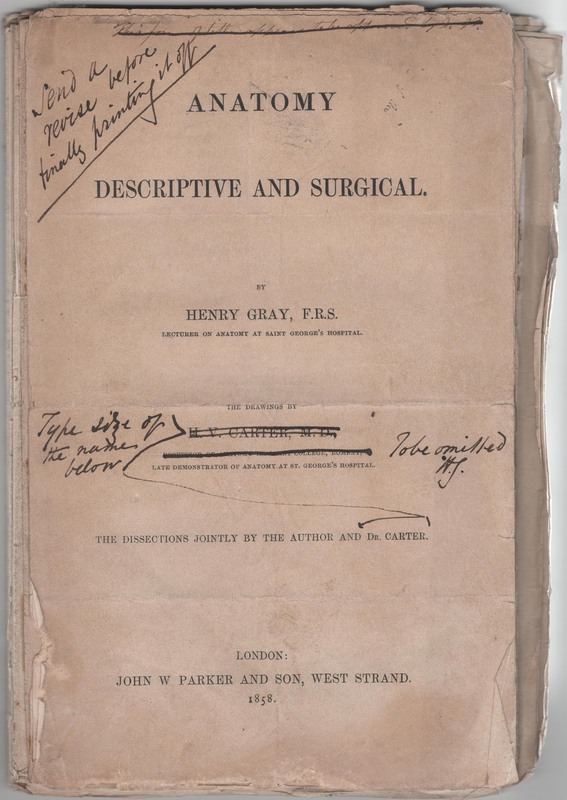 In the 1940s we received a partial set of first edition final page proofs of Gray’s Anatomy bearing the corrections made by its author Henry Gray (1827-61). This set of Wertheimer proofs, complete with ink splodges, are a particular delight not just for historians of medicine or book publishing, but also those interested in the relationship between Henry Gray and medical illustrator Henry Vandyke Carter (1831-97). Until recently, the latter’s crucial contribution to Gray’s Anatomy has been largely obscured, and curiously, from a study of the proof’s title page, one could be forgiven for thinking this was the intention of the ambitious anatomist and surgeon Henry Gray. Now in its 41st revised edition, it could be argued that the success of Gray’s Anatomy rests considerably on the 360 meticulous and vivid illustrations created by Henry Carter, apothecary-surgeon, microscopist and artist. Carter’s drawings were particularly notable for their size, boldness and concise detail, making the quality of Gray’s something very different by comparison to contemporary text books and anatomical works. 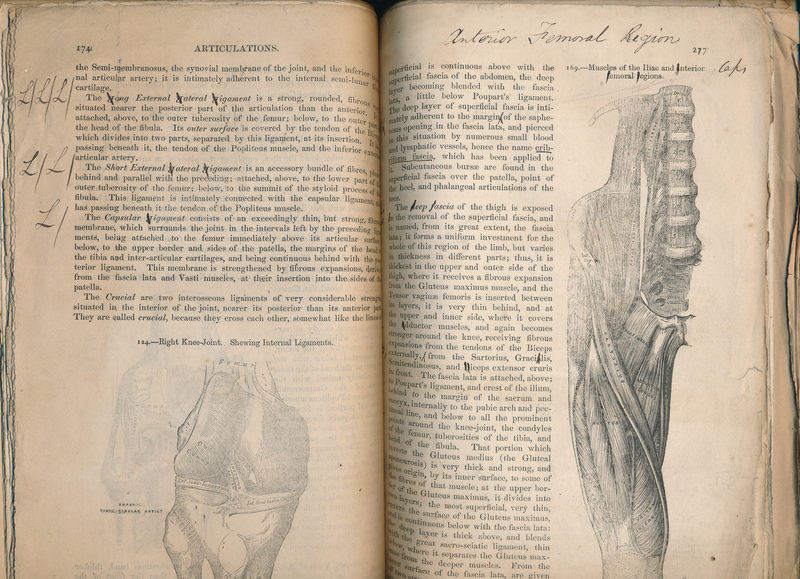 Gray’s Anatomy was not just larger (in light of the enormous woodblocks made from Carter’s drawings by engraving firm Butterworth and Heath), but well-adapted to help anatomy students and surgeons, with a clear layout, easy navigation and greater clarity through new labelling techniques and advanced arrangement, making the text more readable and useful. Most importantly, it was affordable. Richardson therefore notes, “the first edition...knocked its competitors into a cocked hat”. (1) Interestingly, she also points out that “neither the [dissected] subjects nor the viewers experience pain in Carter’s rendering: his images minimize the flinch”. Carter’s caring personality, as evidenced in his diaries and letters, manifests itself in his beautiful illustrative plates, marking a departure from anatomical works such as that by Richard Quain in Quain’s Anatomy, as Richardson argues, where the subjects are presented more starkly, less elegantly and less respectfully. In 1855 when Gray’s was being conceived, Gray was aged 28 and Carter 24, with the pair having first met in the dissection room at St. George’s Hospital around 1848, when Carter was a student. Throughout the creation of Gray’s, the two friends worked both separately (Gray on the text, Carter on the surgical anatomy illustrations) and as a joint enterprise; for a duration of at least 18 months they carried out the dissections on corpses from St. George’s Hospital and London’s workhouses, on which the text and illustrations were based. By necessity, the duo would have worked closely together on a daily basis in the dissection room at Kinnerton Street, in confined space for prolonged periods. The two Henry’s had very different personalities; Carter, humble, self-effacing, prone to solitude, and being 4 years younger, less advanced in his career than the distinguished anatomist Gray, who by comparison, was more confident, high-spirited and it could be argued, fame-hungry. Richardson has provided a number of convincing arguments leading her to conclude that Gray was the “golden boy”, while Carter “felt an outsider”. (2) Yet, Gray was aware that his illustrative skills were weak by comparison to the talented artist Carter’s, whose eye for microscopic precision in drawing was perhaps unrivalled. There is no doubting that the work involved in Gray’s Anatomy was the result of a truly collaborative process. However, Gray’s edits and instructions on the final proof display a grudging spirit toward his illustrator, suggesting the career-minded Gray was focused on the end prize for himself from the outset. The manuscript arrived at RCSEd in 1946 via College Fellow, surgeon and medical historian Douglas Guthrie, having been sent to him from the American family of Mr. M. R. Sheridan FRCSEd, whose wish was that the “proofs be presented to RCSEd Lib. as a gift”. The transfer correspondence is mostly vague regarding provenance: “I must explain my sister gave them to me. She got the pages from someone else, whose relations were doctors…she discovered them among her grandfather’s papers after his death”. It is also unclear why the page proofs survived in partial form. Comprising the title page, preface and pages 163-74; 277-6; 308-320; 417-420 ,and most of the final quarter of the book, pps 593-688, thankfully the section containing Carter’s beautiful artery drawings have survived. The proof would have been passed to Gray after composition by printer John Wertheimer, with the layout specified by publishers J.W. Parker & Son. Corrections have been made on the majority of pages, although the modifications for the most part are unremarkable – spelling errors and capitalisation for instance. However, the title page is far from unremarkable. As can be seen below, the credit to the authors was originally presented in the same size of typeset, both in capitals, although Carter’s name is strategically placed lower down the page. Carter had recently been appointed as Professor of Anatomy at Grant College, Bombay and this was recognised on the proof. Shockingly, though, while overseeing the proofing process, Henry Gray made what appears to be a determined and heavy-handed slash through the medical illustrator’s new job title, as can be seen. And to make his point as clear as possible, he included caption: “To be omitted HG”. Had he been presented with these proofs what would Henry Carter have made of this apparent disregard, bearing in mind he had already left England for India when the final proof went to print? It would seem there was little ambiguity in Gray’s wider intentions to assume principal credit, with his medical illustrator friend offered a marginal role for the purpose of furthering his career, and also perhaps, his ego. It would be reasonable to suggest then, that the two Henrys friendship was not what it seemed. Richardson has carefully examined the diaries of Henry Carter (held at the Wellcome Library), and throws light on the relationship between himself and Henry Gray It is clear that tensions already existed in the earliest days of the project: “Carter seems to have had a sense that Gray was trying to entice him into something he would not have chosen to do”. (4) As a surgeon-apothecary concentrating on doctoral study, with the examinations held in 1856, much of this trepidation was no doubt due to a heavy workload. 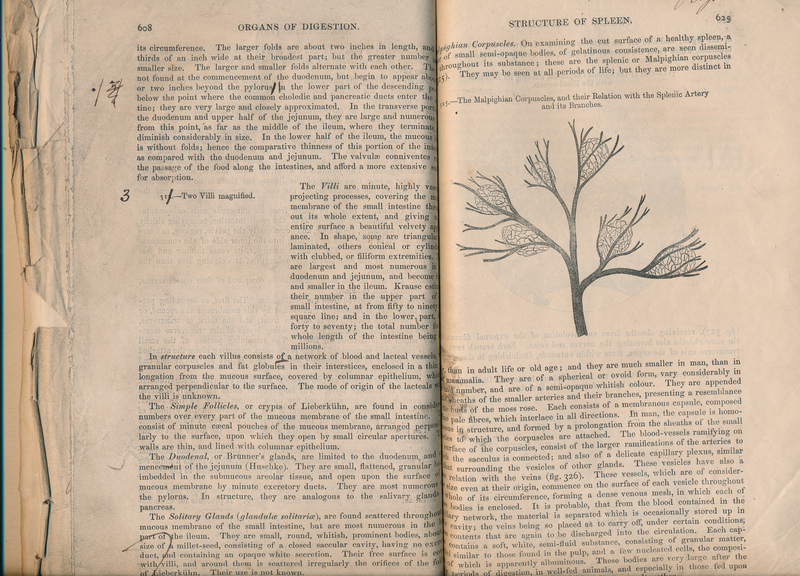 Revealingly, though, Carter had been quietly seething since Gray’s reluctance to extend courtesy to him for his earlier work, On the Structure and Use of The Spleen (1853), in which he provided the medical illustrations. No obvious gratitude was extended to Carter for the endless hours he spent drawing the specimens for Gray, despite the preface attributing thanks to other individuals and organisations. Gray had also been the recipient of the Astley Cooper Prize, which furnished him with 300 guineas, again with no credit to Carter. 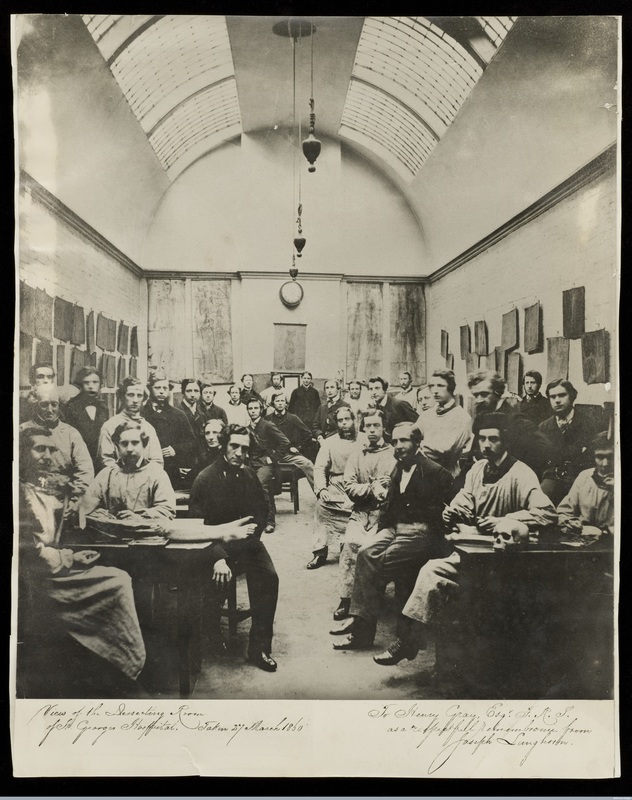 Additionally, the artist also noted in his diary that Gray “will not pay the full sum” for separate drawings he had carried out for the medical school. (5) A comment from Carter’s diary regarding Gray’s refusal to recognise Carter’s contributions is illuminating: “jealous p’raps”. (6) Thus, while Carter clearly held Gray in high esteem, there was a passive resentment, and with good reason. Interestingly, Gray’s refusal to attribute credit to others became more apparent after publication of Gray’s Anatomy, with early reviews accusing Gray as being unoriginal in his text, relying heavily on existing published anatomical works without extending due acknowledgement. It is unfortunate that no personal papers of Henry Gray survive in which he would have opportunity to defend himself. Yet, there can be no doubt from the available evidence, that in his quest for fame, he made a strategic decision to marginalise image from text, and ultimately deny Henry VanDyke Carter due recognition. Gray’s Anatomy was an immense accomplishment, excelling both as text book and work of art. Carter's original drawings remained in use for 60 years before becoming outclassed by modern illustrations. 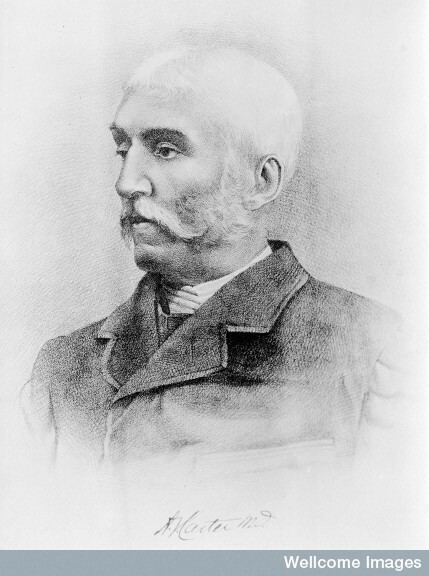 Without Carter’s outstanding illustrative contribution to Gray’s Anatomy, it would not have become the student manual of surgical anatomy, that it is to this day. (1) Ruth Richardson, The Making of Mr. Gray’s Anatomy (Oxford University Press, 2008), 210. (3) Hugh Aldersey-Williams, Anatomies: A Cultural History of the Human Body (W.W. Norton, 2014), 79. (6) Quoted in ibid., 144.